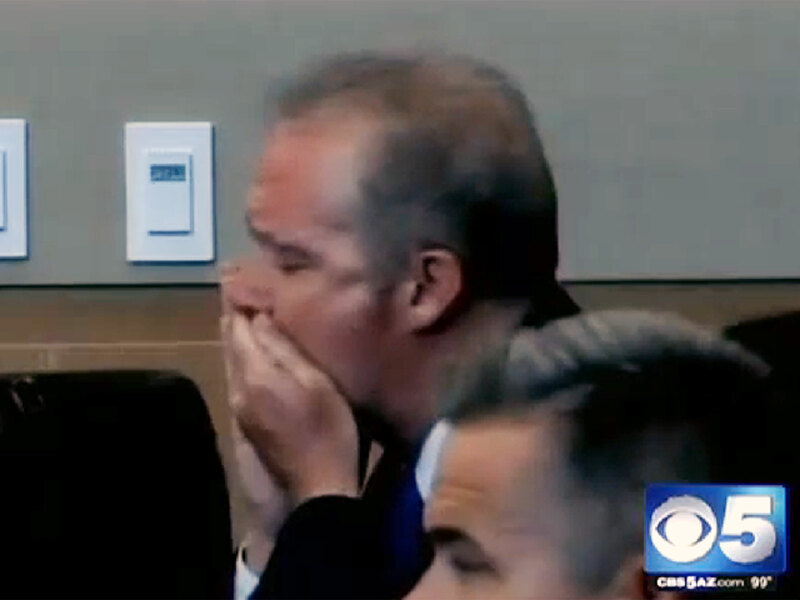 (CBS/AP) PHOENIX - Arizona man Michael Marin collapsed in court and died Thursday after hearing a jury convict him of burning down his $3.5 million mansion, CBS affiliate KPHO-TV reports. Court officials said the judge and lawyers were discussing aggravating factors and the jury was out of the room when 53-year-old Marin's face suddenly turned red and he collapsed to the floor. He was taken to the hospital where he was pronounced dead, according to the Maricopa County Sheriff's Office. Investigators said Marin deliberately burned down his $3.5 million suburban Phoenix mansion in July 2009 after it failed to sell at a charity auction and he could no longer pay the mortgage. He was seen escaping the fire by climbing down a rope ladder while wearing scuba gear. A Maricopa County Superior Court jury found Marin guilty Thursday afternoon of arson of an occupied structure. Prosecutors said he could face16 years in prison if he was convicted. A video recording of Marin's last moments in court has some officials wonder whether his death was a suicide. The video showed Marin cover his mouth and his hands while hearing the guilty verdict and apparently swallowing something, KPHO-TV reports. He was also seen occasionally sipping from a sports drink bottle before his body twisted into violent convulsions. Maricopa County Sheriff's Office is investigating the cause of Marin's death. A spokesman told KPHO-TV that the video makes it seem like Marin was putting something in his mouth, but nothing can be determined until they receive the toxicology report two weeks later.